Rub-a-dub-dub, look whos in the tub! 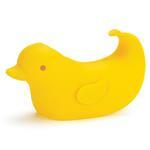 Moby and Ducky are spout covers that brighten up the bath while keeping babys head safe from bumps. The sleek designs include an adjustable strap that fits snugly on most tub spouts, and a tail thats also a handy hook, so Moby and Ducky can hang around when bathtimes done.